› Author Affiliations Funding This study was funded by private donations from patients and doctors, with corporate support from UNIO HOMOEOPATHICA BELGICA (Belgian MD Homeopathic Union). Background Homeopathy is controversial due to its use of very highly diluted medicines (high potencies/dynamisations). 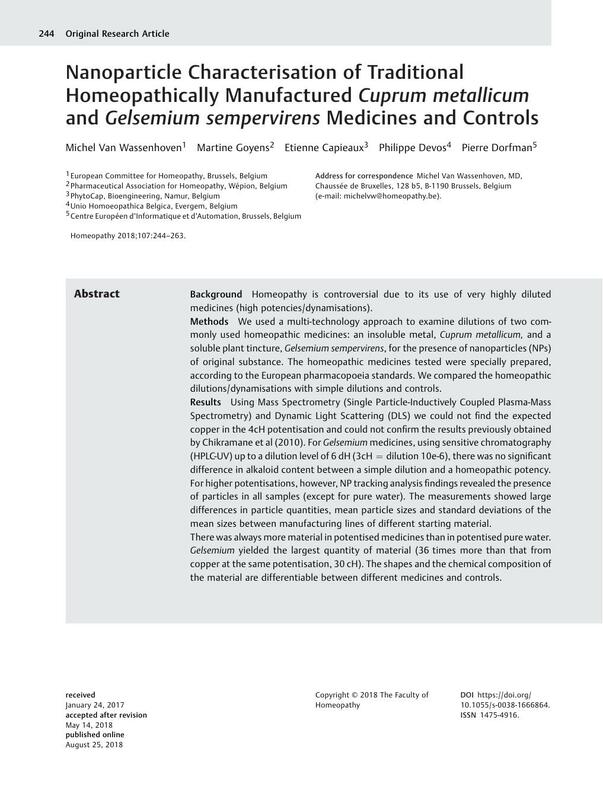 Methods We used a multi-technology approach to examine dilutions of two commonly used homeopathic medicines: an insoluble metal, Cuprum metallicum, and a soluble plant tincture, Gelsemium sempervirens, for the presence of nanoparticles (NPs) of original substance. The homeopathic medicines tested were specially prepared, according to the European pharmacopoeia standards. We compared the homeopathic dilutions/dynamisations with simple dilutions and controls. Results Using Mass Spectrometry (Single Particle-Inductively Coupled Plasma-Mass Spectrometry) and Dynamic Light Scattering (DLS) we could not find the expected copper in the 4cH potentisation and could not confirm the results previously obtained by Chikramane et al (2010). For Gelsemium medicines, using sensitive chromatography (HPLC-UV) up to a dilution level of 6 dH (3cH = dilution 10e-6), there was no significant difference in alkaloid content between a simple dilution and a homeopathic potency. For higher potentisations, however, NP tracking analysis findings revealed the presence of particles in all samples (except for pure water). The measurements showed large differences in particle quantities, mean particle sizes and standard deviations of the mean sizes between manufacturing lines of different starting material. There was always more material in potentised medicines than in potentised pure water. Gelsemium yielded the largest quantity of material (36 times more than that from copper at the same potentisation, 30 cH). The shapes and the chemical composition of the material are differentiable between different medicines and controls. Conclusion Potentisation influences specifically the nature of NPs detected. This material demonstrates that the step-by-step process (dynamised or not) does not match with the theoretical expectations in a dilution process. The Avogadro/Loschmidt limit is not relevant at all. It was not possible to reproduce the findings of Chikramane et al (2010) using inductively coupled plasma-mass spectrometry with copper. Copper NPs could not be detected at 4cH and above. • The nature of homeopathic medicines even in highest dilutions is identified using modern measurement methods. • The presence of material in high-diluted homeopathic medicines invalidates the Avogadro/Loschmidt limit for homeopathic potentisations. • Starting material is not identifiable in high homeopathic potentisations.